How often have you given thought to your life, your time, how you spend it and the areas that are most important to you? Each season I find myself revisiting this question, looking at my life, and gaining clarity on the areas that might need more attention and/or planning. If I do not focus on this, I go into reactive mode, which inevitably will be less healthy and an escape from what I know works best for me, and what truly helps me to live my best life. I believe most of us experience this, and that is part of life, and knowing the steps to take, and having a tool box and daily practice can help us to be on track and be balanced in mind/body/spirit. For me, the most important foundation is health and self care, when I am working daily on this and taking good care of myself, it provides the strong foundation to work on the other areas of my life. I believe that is true for most of us. As we are in the last weeks of summer, I am feeling my usual feel, I need my eating, daily routine and structure back to a good place, at this time of year I tend to feel off balance, and this is a sign to start to plan all areas of my life, to get back to the balance & place that helps me to thrive. After coaching women in life & business for years, I know this to be true for most women. That is why there are seasons and that is why each season is an opportunity to access where we are, and plan how we will be balanced in our Life Map. 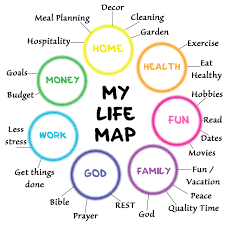 Look at the areas in your life, and see where you are and also where you want to be. Health: Are you exercising, eating well, and filling your mind with positive things? Mind/Body & Spirit can truly change when we honor our health. Family: Are you making time for family and is the time together quality time? What can you do to plan more of that this Fall? God: Are you taking time spiritually every day? What if we did more of this, and truly brought more of this into our lives? Seek Spirituality. Work: Are you doing work that is meaningful and you enjoy? Are you aligned with your greatest purpose and your highest self? If not, change that. Home: Is your home a place you feel comfort, calmness and does it reflect who you are? What project can you do to create your HIPP spaces? Money: Are you feeling in debt or are you feeling abundant and debt free. How can you manage your money and increase your income? Fun: What do you do for fun? Is it what brings out your best self? How can you add more fun to your life and make time for fun activities? It is the perfect time of year to access these areas in your life and decide where you want to focus most. Rome was not built in a day and neither is your life. It is in the daily practice that we align ourselves with our purpose, our joy, our freedom. Look at these areas and decide how you will address each one this season—choose one area to really focus on, and decide what you can do in each area of your life. Your life map is not a destination. It is an ever-changing road, with stops and bumps along the way. If you have taken a detour, it is okay, let it be a signpost to find your path, and determine the direction that is best for you to go in. Mindfulness around this will help you see clearly, and embrace the road ahead. Have a vision for what you want, and be brave enough to take daily action, practice patience and gratitude along the way. Map it out, take action daily, and be okay when you hit a fork in the road, it is just a sign, be open and aware of what that sign is telling you. See it. Plan it. Do it.